Did the proverbial sun set on the Bengals season and window of contention in 60 New York Minutes last night? New York delivered Cincinnati its latest case of the Primetime Blues as the Bengals dropped their third straight Monday Night Football foray and fell to 3-5-1 on the season, downgrading their chances for a sixth consecutive playoff berth from ‘unlikely’ to ‘on life support.’ And with few more well-timed gaffes—another a pass protection snafu here, another defensive penalty to prolong a drive there—the cord on Cincinnati’s 2016 Season Ventilator will be unplugged from the wall, and the franchise will fail to qualify for the playoffs for the first time since 2010, the Year that Broke Carson Palmer. Leading up to Monday, Paul Dehner Jr. of The Cincinnati Enquirer noted on the Bengals.com Media Roundtable that just as the Bengals 31-13 victory over the Giants in the franchise’s last meeting four years ago served as the the opening of the Bengals recent ‘window’ of contention—3-5 prior to that victory, Cincinnati won seven of its last eight games to reach the postseason, and would win 43 games from 2012-15—a setback in New York could signal the closing of that window for a rapidly aging core. Nine games into the 2016 season, it has become difficult to ignore what the sands of time have done to this team. We were led to believe a shootout was to be staged at MetLife Stadium, as the over/under for combined points was set at a healthy 49.5. 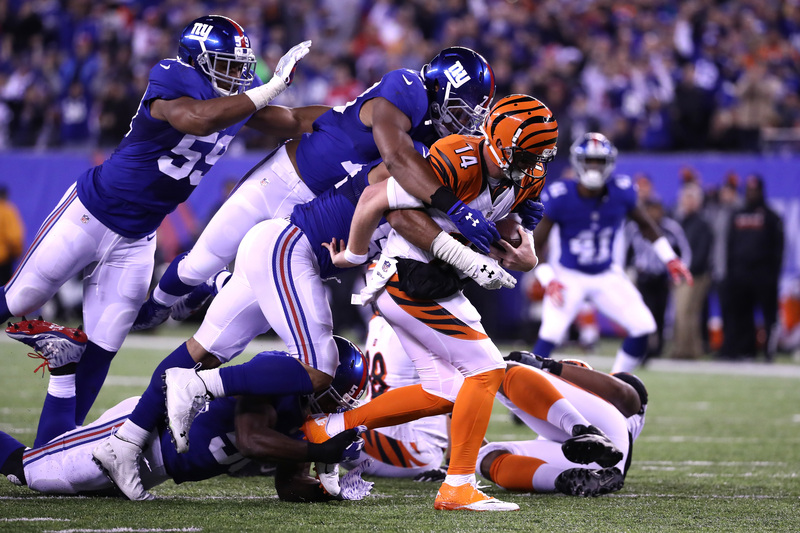 After the Giants and Bengals traded rapid 80-yard touchdown drives within the game’s first four minutes, it sure looked like the Over Crowd was in for a profitable night. First two possessions of the game: 11 plays, 160 yards, 14 points. Next eight possessions: 42 plays, 110 yards, three points, five punts, one turnover on downs, one interception. After the Bengals had to settle for a field goal following Dre Kirkpatrick’s interception and return to the Giants 7-yard line about halfway through the second quarter, New York predictably marched down the field against a weary, aging defense that had endured 14 more snaps than their counterparts to that point. A saucy touchdown pass from Eli Manning to Odell Beckham Jr. that sauteed Adam Jones soon followed, and the visitors found themselves down four points just before halftime. And that’s when the president of the Marvin Lewis School of Bizarre Clock Management delivered an impromptu keynote address. Taking over on their own 20 with 1:11 left prior to intermission and holding one timeout, the Bengals ran Gio Bernard for two yards. It appeared that the offense was content to burn off the clock and/or force the Giants to use all of their three timeouts if the hosts preferred to reacquire possession. It’s not the strategy I would have employed, but the line of thinking was a reasonable course of action. But instead of turtling the drive, Cincinnati ran another play with 40 seconds remaining (failing to burn all of the 40-second play clock), a nine-yard pass from Andy Dalton to Brandon LaFell that reached the Bengals 31. The clock continued to run. With 17 seconds left in the half, Dalton found A.J. Green for 14 yards to the Bengals 45. A short pass to Tyler Eifert, a timeout, and a failed Hail Mary later, the half was over. In a quintessential summation of their undistinguished and languid season to date, Lewis and the Bengals decided to neither attempt to score nor run out the clock, alternatively selecting a puzzling middle ground. Alex Erickson’s 84-yard kick return to start the second half spawned a quick touchdown drive, and the Bengals appeared eager to seize sovereignty over the game—especially after Paul Guenther’s mildly-rejuvenated defense forced a 3-and-out on the next Giants drive. But, Tyler Boyd failed to finish the process of the catch whilst hovering over the goal line on 3rd-and-5 from the New York 20, and Mike Nugent was called upon for another field goal. It was at that point the Bengals offense imploded, registering 37 yards on 23 plays over their next five possessions, a quinet of drives that concluded in four punts and an interception. Competing in front of the nation’s eyes, the Giants—well, maybe just Manning—practically begged the Bengals to win this one with oversights of their own. The Bengals declined the party favors, content to fall deeper into the mediocrity vortex that has become their 2016 campaign. Not only is Cincinnati resting comfortably in third place in what’s become a forgettable AFC North race, but its point differential sits at minus-23, which ranks 12th out of the 16 AFC squads; it is only because of their feeble division that the Bengals retain faint playoff hopes. So, what do you believe, Bengals Fan? I know I’m no fool.